We educate the community and policy makers through our website and blogs. We also help inform the medical community, researchers, and policymakers through medical journal publication. Our board members have over 40 peer-reviewed publications. We inform the community about Lyme disease through our quarterly digital journal, The Lyme Times. Members of LymeDisease.org enjoy exclusive access to online issues of The Lyme Times, one of the most respected publications in the industry covering Lyme and other tick-borne diseases. This premier, quarterly magazine looks at issues that aim to educate and improve patients’ lives. 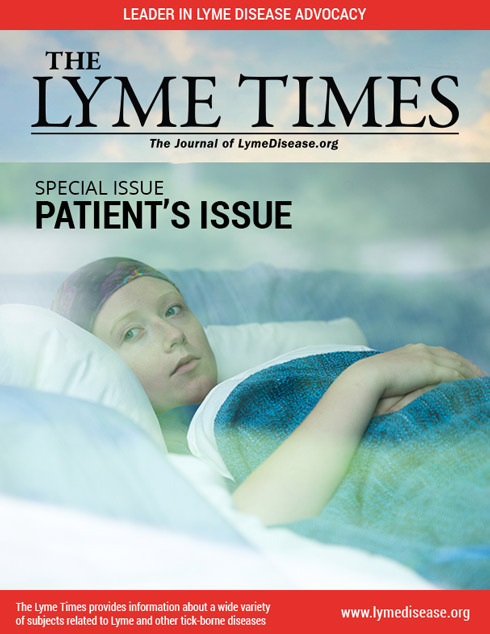 The Lyme Times provides the best in features, news and commentaries, written by leading Lyme-literate physicians, world-renowned scientists and patient advocates. The journal explores a broad range of topics including treatment options, diagnostic testing, children and tick-borne diseases, disability coverage, insurance challenges and patient data analysis. Solving the critical health problems faced by Lyme patients requires grassroots involvement as well as local and national advocacy. We promote these efforts through our state-based internet groups that teach patients how to make a difference in the fight for early diagnosis and treatment. We also lead the charge in protests and petitions. Our petition calling for revision of the treatment guidelines of the Infectious Diseases Society which deny care to patients with Lyme disease has drawn over 30,000 signatures. LDo funds research that matters to patients. Our research committee includes scientists, physicians and patients working together to determine and fund patient centered research. LDo has funded research at Stanford, the University of Connecticut at New Haven, Stony Brook, and Johns Hopkins. We engage patients in crowdfunding campaigns to promote the work of Lyme research. Over 10 years ago, we started collecting and publishing patient data through surveys of thousands of patients. Today, our big data project, MyLymeData, is the largest study of Lyme disease ever conducted–with over 10,000 patients enrolled. The National Science Foundation has granted $800,000 to academic researchers at UCLA and Claremont McKenna to explore big data techniques using data from the registry. LDo provides legal, ethical and healthcare policy analysis for the Lyme community. We fight for access to appropriate medical care for Lyme patients and for the rights of their treating physicians. We review state and federal legislation and compile data from our surveys to support policy change. We were a driving force behind the Connecticut Attorney General’s civil investigation of the Infectious Diseases Society of America’s Lyme guideline development process. We provide a number of healthcare policy resources, as well. We seek to change public healthcare policy through advocacy and science. For the past 10 years, our executive director has been actively involved in the arena of evidence-based medicine and patient-centered care, both nationally and internationally. Currently, she leads the Patient Council for PCORnet, the research network of a government funding agency called the Patient Centered Outcomes Research Institute. She also is Co-Chair of Consumers United for Evidence-Based Medicine, a coalition of 40 patient organizations, and is a consumer peer reviewer for the Cochrane Colloquium.